Oxford Dic­tio­nar­ies tells me that the word and con­cept of a “mag­a­zine” goes way back: “The term orig­i­nal­ly meant ‘store’ and was often used from the mid 17th cen­tu­ry in the title of books pro­vid­ing infor­ma­tion use­ful to par­tic­u­lar groups of peo­ple.…” The mag­a­zine indus­try at one time was an enor­mous­ly suc­cess­ful one. From gen­er­al inter­est mag­a­zines to arcane pub­li­ca­tions, the num­ber of peri­od­i­cals grew and grew. In recent years, many of us have can­celled our sub­scrip­tions as dig­i­tal devices filled the niche for any­one want­i­ng to read any kind of infor­ma­tion. The num­bers from the US in 2011 tell the sto­ry: print­ed mag­a­zines are shrink­ing while those pub­lish­ers savvy enough to move their jour­nals to a dig­i­tal plat­form saw at least some hope in their cir­cu­la­tion num­bers. Yet, the 1600’s con­cept of a “mag­a­zine” is still what most peo­ple think of when the word is men­tioned. The idea is that a team of edi­tors with above-aver­age knowl­edge of the sub­ject field col­lect the best arti­cles and art­work and pack­age them for deliv­ery to inter­est­ed read­ers. That idea is now sooooo-2012. As Paul Arm­strong on paid­Con­tent report­ed less than a week ago, the dig­i­tal plat­form man­aged by Flip­board (@Flipboard) has just rein­vent­ed the con­cept of a mag­a­zine and put you and me in charge. We are talk­ing rev­o­lu­tion here, as mag­a­zines could soon be rede­fined as an intel­li­gent col­lec­tion of arti­cles by any­one and for any­one. In case your head is slight­ly swirling here, let me high­light the basics of this rev­o­lu­tion. What is Flip­board? This is an app that you can use on most, if not all, dig­i­tal devices. It’s per­fect for any dig­i­tal pad (the idea of a desk­top Flip­board app is under con­sid­er­a­tion). What the app does is col­lect arti­cles from a wide range of oth­er pub­li­ca­tions and allow you to organ­ise and review them as you wish and in just about any order. From break­ing news to finance to pol­i­tics to trav­el to trib­utes & obitu­raries: one can eas­i­ly assem­ble the flow of infor­ma­tion in a design that you select. Where’s the rev­o­lu­tion in that? Okay, a lot of pub­li­ca­tions now do much the same thing; and, oth­er than Flip­board being an inter­me­di­ary for lots of oth­er jour­nals, one’s excite­ment lev­el could be eas­i­ly con­tained. Paul Arm­strong cites this link in his blog post: “Flip­board launch­es cus­tom cura­tion tools, wants to unleash your inner mag­a­zine edi­tor”, which was writ­ten by Matthew Ingram on GIGAOM. So, here’s the rest of the rev­o­lu­tion. 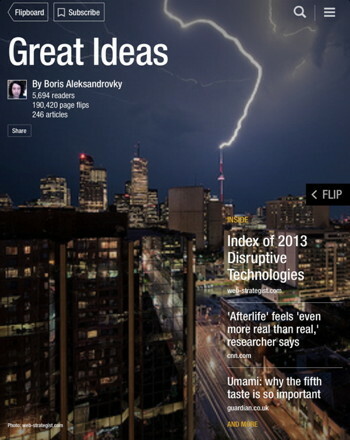 Flip­board now enables any of its read­ers to search (via Flip­board) any sub­ject, peruse results and assem­ble the best-found infor­ma­tion into a mag­a­zine that can be shared with the rest of the world. As Ingram describes the inno­va­tion: “It’s a lit­tle like Pin­ter­est merged with Tum­blr, crossed with a bet­ter-look­ing and more social ver­sion of Google Read­er.” The mag­a­zine-cre­ation func­tion is lim­it­ed to iOS for now; Android capa­bil­i­ty is com­ing. Reg­u­lar peo­ple putting their own mag­a­zines togeth­er and shar­ing them? About what?!? This is where it all gets fas­ci­nat­ing. Sup­pose I had an inter­est in “Great Ideas”, I could (with this app) find a high­ly focussed digest of what­ev­er that phrase means to me (cre­at­ing great ideas? 50 great ideas? why aren’t there more great ideas?) and send you a link via e-mail that invites you to read what I just “pub­lished”. Then again, I could make my edi­to­r­i­al hand­i­work pub­lic, in which case my mag­a­zine would be search­able via Flip­board. More­over, Flip­board takes a healthy sam­ple of pub­lic mag­a­zines and fea­tures them. I’m scan­ning some 60+ of them now and I am daz­zled by the cre­ativ­i­ty. Some just-made jour­nals include: Sal­ad bal­lad, British coast­lines, Strug­gles of War, Start­up News, Great Talks, Email Mafia and Jel­ly­fish and Atom Bombs. Can you update your mag­a­zine? Yes, by adding or remov­ing con­tent — even change your cov­er art as you update your pub­li­ca­tion. You can even weave in arti­cles found via stan­dard browsers. And, since the mag­a­zine is eas­i­ly linked to social net­works, you can cre­ate your own copy by first plac­ing it on Twit­ter, Face­book, and oth­ers then adding it to your jour­nal. Last­ly, if your read­ers like what you have pub­lished, they can sub­scribe to it and receive updates as you post new mate­r­i­al. You men­tioned a pos­si­ble jour­nal on “Great Ideas”. Any­one done that yet? Yes. Boris Alek­san­drovky has done this, and Flip­board keeps tab of the stats on the suc­cess of his pub­li­ca­tion. As of my view­ing, he had 5,694 read­ers; 190,420 page flips; and 246 arti­cles with­in. Nice! Where can I find out more about this? There’s a good intro­duc­tion pre­pared by Flipboard.com, but I would encour­age you to watch the video embed­ded in Paul Armstrong’s post, which fea­tures Flipboard’s CEO offer­ing his own tour of the con­cept. But you won’t have to go far to find news about the con­cept. Since its launch of this ser­vice, Flip­board has brought its sub­scribers up to 53 mil­lion — and, in just a short time, some 500,000 mag­a­zines have been cre­at­ed. When one is in the field of nextsens­ing, one does not casu­al­ly use the word “rev­o­lu­tion”. I hope I have indi­cat­ed why I think the term is jus­ti­fied. But I should leave you with a few oth­er thoughts. Hats off to Flip­board for this effort, but the real news here is the poten­tial dis­rup­tive nature of how self-pub­lish­ing is evolv­ing from the ear­ly days of blog post­ing, lik­ing things on Face­book and par­tic­i­pat­ing in chat forums. Think of how far music has come since Nap­ster. We’re prob­a­bly at the launch­pad of a whole new way to sub­scribe to news and fea­tures. Look for an expo­nen­tial jump in apps that take this con­cept even fur­ther! This rev­o­lu­tion is about the democ­ra­ti­sa­tion of per­son­al voice, the spead at which these empow­er­ing shifts are tak­ing place, and the incred­i­ble high qual­i­ty out­puts that are pos­si­ble (as with ebooks, garage bands, elearn­ing and beyond). In the 1400s, Guten­berg rev­o­lu­tionised mov­able type on a print­ing press; today, the col­lec­tive e-world is rev­o­lu­tion­is­ing imme­di­ate type. Paul Arm­strong titled his post “Flip­board is a giant ice­berg lurk­ing in the path of the media”, the impli­ca­tion being that mag­a­zine pub­lish­ers are, at best, cor­po­rate Titan­ics soon to sink. That’s at least one pos­si­bil­i­ty, but I’m hear­ing the warn­ing sirens now blar­ing for uni­ver­si­ties, book pub­lish­ers and book­sellers and every media mag­nate I can now think of. This pub­lish­ing rev­o­lu­tion is get­ting per­son­al.